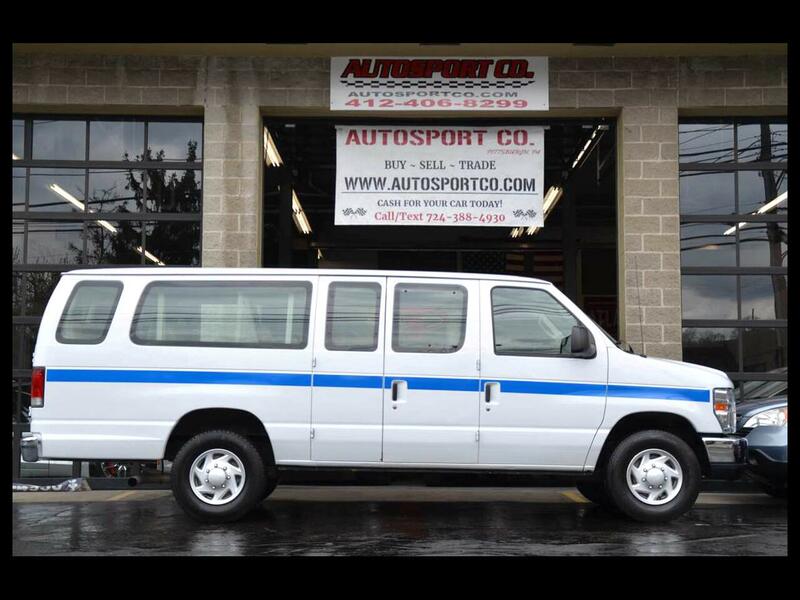 Used 2014 Ford Econoline E-350 XLT Super Duty Extended 15 Passenger Van for Sale in Indiana PA 15701 AutoSport Co. Offered for sale is a Clean Carfax, 2014 Ford E350 XLT Extended Wagon 15 Passenger Van with only 83k miles that was recently serviced and is ready to haul! These 15 passenger vans can be hard to find, and being an XLT this one surely sticks out from the rest. This 2014 Ford E350 is in excellent condition and has been well maintained since purchased new according to the previous owner, please see photo with the most recent service report. This E350 XLT Extended Wagon 15 Passenger Van is equipped with a lot of factory options and runs and drives out excellent! Around the Oxford White exterior, very minimal wear is present and the chrome bumpers and grill give this van a great look! The blue stripe along both sides can easily be removed if you’d prefer. The Sport wheel covers show great and the tires all look to be in new condition! Throughout the beige cloth interior, there is very minimal wear present, and the dash area and console all show very well! In addition this 2014 Ford E350 XLT Extended Wagon 15 Passenger Van with only 83k miles is equipped with options such as: Clean Carfax, 5.4L V8 Engine, XLT Trim Package, Chrome Front and Rear Bumper, Chrome Front Grill, Preferred Equipment Package, Power Windows, Power Locks, Front and Rear Climate Control/Air Conditioning, Cruise Control, Original Owners Manual, Power Mirrors, Hinged Side Cargo Doors, Swing Out Side/ Fixed Rear Door Glass, AM/FM/CD/AUX Player, 33 Gallon Fuel Tank, PA Inspection and much more!! For more information on this hard to find, 2014 E350 XLT 15 Passenger Van feel free to call/text Anthony at 724-388-4930. This van is located at our Pittsburgh location; we accept trades and can help with financing options! Thank you for your interest!